I only converted the examples to Go. It is assumed that you know how to use vi and to compile and run Go code. A topic that can easily make anyone&apos;s mind wobble. Here I try to make them stick in to your mind (and maybe mine) by explaining them in the simplest way possible. In software engineering, a software design pattern is a general reusable solution to a commonly occurring problem within a given context in software design. It is not a finished design that can be transformed directly into source or machine code. It is a description or template for how to solve a problem that can be used in many different situations. Design patterns are not a silver bullet to all your problems. Do not try to force them; bad things are supposed to happen, if done so. Keep in mind that design patterns are solutions to problems, not solutions finding problems; so don&apos;t overthink. If used in a correct place in a correct manner, they can prove to be a savior; or else they can result in a horrible mess of a code. Also note that the code samples below are in Go, however this shouldn&apos;t stop you because the concepts are same anyways. And that about wraps it up. I will continue to improve this, so you might want to watch/star this repository to revisit. Also, I have plans on writing the same about the architectural patterns, stay tuned for it. Creational patterns are focused towards how to instantiate an object or group of related objects. Consider, you are building a house and you need doors. You can either put on your carpenter clothes, bring some wood, glue, nails and all the tools required to build the door and start building it in your house or you can simply call the factory and get the built door delivered to you so that you do not need to learn anything about the door making or to deal with the mess that comes with making it. Go ahead save and quit vi. Then, build and run. When creating an object is not just a few assignments and involves some logic, it makes sense to put it in a dedicated factory instead of repeating the same code everywhere. Consider the case of a hiring manager. It is impossible for one person to interview for each of the positions. Based on the job opening, she has to decide and delegate the interview steps to different people. It provides a way to delegate the instantiation logic to child classes. Useful when there is some generic processing in a class but the required sub-class is dynamically decided at runtime. Or putting it in other words, when the client doesn&apos;t know what exact sub-class it might need. Extending our door example from Simple Factory. Based on your needs you might get a wooden door from a wooden door shop, iron door from an iron shop or a PVC door from the relevant shop. Plus you might need a guy with different kind of specialities to fit the door, for example a carpenter for wooden door, welder for iron door etc. As you can see there is a dependency between the doors now, wooden door needs carpenter, iron door needs a welder etc. A factory of factories; a factory that groups the individual but related/dependent factories together without specifying their concrete classes. As you can see the wooden door factory has encapsulated the carpenter and the wooden door also iron door factory has encapsulated the iron door and welder. And thus it had helped us make sure that for each of the created door, we do not get a wrong fitting expert. Imagine you are at Hardee&apos;s and you order a specific deal, lets say, "Big Hardee" and they hand it over to you without any questions; this is the example of simple factory. But there are cases when the creation logic might involve more steps. For example you want a customized Subway deal, you have several options in how your burger is made e.g what bread do you want? what types of sauces would you like? What cheese would you want? etc. In such cases builder pattern comes to the rescue. Allows you to create different flavors of an object while avoiding constructor pollution. Useful when there could be several flavors of an object. Or when there are a lot of steps involved in creation of an object. The builder pattern is an object creation software design pattern with the intentions of finding a solution to the telescoping constructor anti-pattern. As you can see; the number of constructor parameters can quickly get out of hand and it might become difficult to understand the arrangement of parameters. Plus this parameter list could keep on growing if you would want to add more options in future. This is called telescoping constructor anti-pattern. When there could be several flavors of an object and to avoid the constructor telescoping. The key difference from the factory pattern is that; factory pattern is to be used when the creation is a one step process while builder pattern is to be used when the creation is a multi step process. Create object based on an existing object through cloning. The prototype pattern is a creational design pattern in software development. It is used when the type of objects to create is determined by a prototypical instance, which is cloned to produce new objects. In short, it allows you to create a copy of an existing object and modify it to your needs, instead of going through the trouble of creating an object from scratch and setting it up. Also you could use the magic method __clone to modify the cloning behavior. When an object is required that is similar to existing object or when the creation would be expensive as compared to cloning. There can only be one president of a country at a time. The same president has to be brought to action, whenever duty calls. President here is singleton. Ensures that only one object of a particular class is ever created. Singleton pattern is actually considered an anti-pattern and overuse of it should be avoided. It is not necessarily bad and could have some valid use-cases but should be used with caution because it introduces a global state in your application and change to it in one place could affect in the other areas and it could become pretty difficult to debug. The other bad thing about them is it makes your code tightly coupled plus mocking the singleton could be difficult. Structural patterns are mostly concerned with object composition or in other words how the entities can use each other. Or yet another explanation would be, they help in answering "How to build a software component?" Adapter pattern lets you wrap an otherwise incompatible object in an adapter to make it compatible with another class. In software engineering, the adapter pattern is a software design pattern that allows the interface of an existing class to be used as another interface. It is often used to make existing classes work with others without modifying their source code. Consider a game where there is a hunter and he hunts lions. And hunter expects any implementation of Lion interface to hunt. And now the WildDog can be used in our game using WildDogAdapter. Consider you have a website with different pages and you are supposed to allow the user to change the theme. What would you do? Create multiple copies of each of the pages for each of the themes or would you just create separate theme and load them based on the user&apos;s preferences? Bridge pattern allows you to do the second i.e. The bridge pattern is a design pattern used in software engineering that is meant to "decouple an abstraction from its implementation so that the two can vary independently"
Every organization is composed of employees. Each of the employees has the same features i.e. has a salary, has some responsibilities, may or may not report to someone, may or may not have some subordinates etc. Composite pattern lets clients treat the individual objects in a uniform manner. In software engineering, the composite pattern is a partitioning design pattern. The composite pattern describes that a group of objects is to be treated in the same way as a single instance of an object. 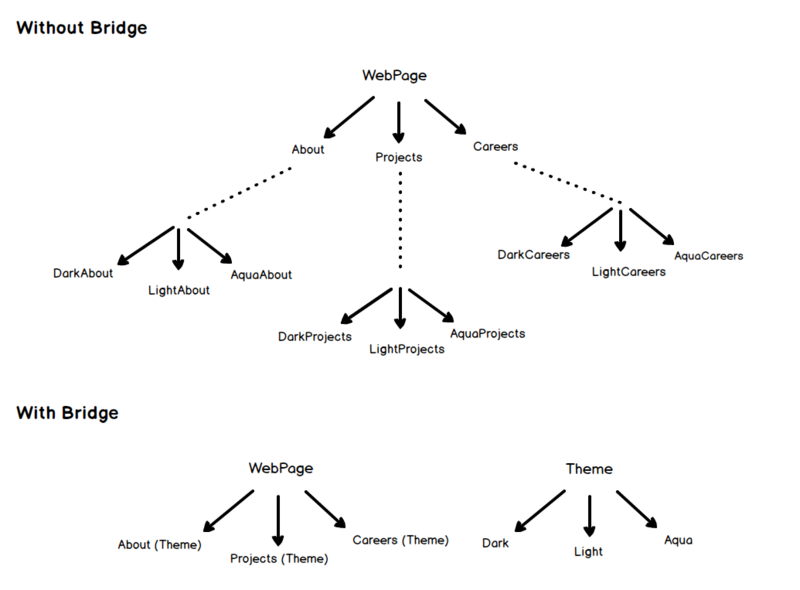 The intent of a composite is to "compose" objects into tree structures to represent part-whole hierarchies. Implementing the composite pattern lets clients treat individual objects and compositions uniformly. Imagine you run a car service shop offering multiple services. Now how do you calculate the bill to be charged? You pick one service and dynamically keep adding to it the prices for the provided services till you get the final cost. Here each type of service is a decorator. Decorator pattern lets you dynamically change the behavior of an object at run time by wrapping them in an object of a decorator class. In object-oriented programming, the decorator pattern is a design pattern that allows behavior to be added to an individual object, either statically or dynamically, without affecting the behavior of other objects from the same class. The decorator pattern is often useful for adhering to the Single Responsibility Principle, as it allows functionality to be divided between classes with unique areas of concern. How do you turn on the computer? "Hit the power button" you say! That is what you believe because you are using a simple interface that computer provides on the outside, internally it has to do a lot of stuff to make it happen. This simple interface to the complex subsystem is a facade. Facade pattern provides a simplified interface to a complex subsystem. A facade is an object that provides a simplified interface to a larger body of code, such as a class library. Did you ever have fresh tea from some stall? They often make more than one cup that you demanded and save the rest for any other customer so to save the resources e.g. gas etc. Flyweight pattern is all about that i.e. sharing. It is used to minimize memory usage or computational expenses by sharing as much as possible with similar objects. In computer programming, flyweight is a software design pattern. A flyweight is an object that minimizes memory use by sharing as much data as possible with other similar objects; it is a way to use objects in large numbers when a simple repeated representation would use an unacceptable amount of memory. Have you ever used an access card to go through a door? There are multiple options to open that door i.e. it can be opened either using access card or by pressing a button that bypasses the security. The door&apos;s main functionality is to open but there is a proxy added on top of it to add some functionality. Let me better explain it using the code example below. Using the proxy pattern, a class represents the functionality of another class. A proxy, in its most general form, is a class functioning as an interface to something else. A proxy is a wrapper or agent object that is being called by the client to access the real serving object behind the scenes. Use of the proxy can simply be forwarding to the real object, or can provide additional logic. In the proxy extra functionality can be provided, for example caching when operations on the real object are resource intensive, or checking preconditions before operations on the real object are invoked. $door->open(&apos;invalid&apos;); // Big no! It ain&apos;t possible. Yet another example would be some sort of data-mapper implementation. For example, I recently made an ODM (Object Data Mapper) for MongoDB using this pattern where I wrote a proxy around mongo classes while utilizing the magic method __call(). All the method calls were proxied to the original mongo class and result retrieved was returned as it is but in case of find or findOne data was mapped to the required class objects and the object was returned instead of Cursor. It is concerned with assignment of responsibilities between the objects. What makes them different from structural patterns is they don&apos;t just specify the structure but also outline the patterns for message passing/communication between them. Or in other words, they assist in answering "How to run a behavior in software component?" For example, you have three payment methods (A, B and C) setup in your account; each having a different amount in it. A has 100 USD, B has 300 USD and C having 1000 USD and the preference for payments is chosen as A then B then C. You try to purchase something that is worth 210 USD. Using Chain of Responsibility, first of all account A will be checked if it can make the purchase, if yes purchase will be made and the chain will be broken. If not, request will move forward to account B checking for amount if yes chain will be broken otherwise the request will keep forwarding till it finds the suitable handler. Here A, B and C are links of the chain and the whole phenomenon is Chain of Responsibility. It helps building a chain of objects. Request enters from one end and keeps going from object to object till it finds the suitable handler. In object-oriented design, the chain-of-responsibility pattern is a design pattern consisting of a source of command objects and a series of processing objects. Each processing object contains logic that defines the types of command objects that it can handle; the rest are passed to the next processing object in the chain. A generic example would be you ordering food at a restaurant. You (i.e. Client) ask the waiter (i.e. Invoker) to bring some food (i.e. Command) and waiter simply forwards the request to Chef (i.e. Receiver) who has the knowledge of what and how to cook. Another example would be you (i.e. Client) switching on (i.e. Command) the television (i.e. Receiver) using a remote control (Invoker). Allows you to encapsulate actions in objects. The key idea behind this pattern is to provide the means to decouple client from receiver. $remote->submit($turnOn); // Bulb has been lit! Command pattern can also be used to implement a transaction based system. Where you keep maintaining the history of commands as soon as you execute them. If the final command is successfully executed, all good otherwise just iterate through the history and keep executing the undo on all the executed commands. An old radio set will be a good example of iterator, where user could start at some channel and then use next or previous buttons to go through the respective channels. Or take an example of MP3 player or a TV set where you could press the next and previous buttons to go through the consecutive channels or in other words they all provide an interface to iterate through the respective channels, songs or radio stations. It presents a way to access the elements of an object without exposing the underlying presentation. In object-oriented programming, the iterator pattern is a design pattern in which an iterator is used to traverse a container and access the container&apos;s elements. The iterator pattern decouples algorithms from containers; in some cases, algorithms are necessarily container-specific and thus cannot be decoupled. A general example would be when you talk to someone on your mobile phone, there is a network provider sitting between you and them and your conversation goes through it instead of being directly sent. In this case network provider is mediator. Mediator pattern adds a third party object (called mediator) to control the interaction between two objects (called colleagues). It helps reduce the coupling between the classes communicating with each other. Because now they don&apos;t need to have the knowledge of each other&apos;s implementation. In software engineering, the mediator pattern defines an object that encapsulates how a set of objects interact. This pattern is considered to be a behavioral pattern due to the way it can alter the program&apos;s running behavior. Here is the simplest example of a chat room (i.e. mediator) with users (i.e. colleagues) sending messages to each other. Take the example of calculator (i.e. originator), where whenever you perform some calculation the last calculation is saved in memory (i.e. memento) so that you can get back to it and maybe get it restored using some action buttons (i.e. caretaker). Memento pattern is about capturing and storing the current state of an object in a manner that it can be restored later on in a smooth manner. Usually useful when you need to provide some sort of undo functionality. Lets take an example of text editor which keeps saving the state from time to time and that you can restore if you want. // Save the state to restore to : This is the first sentence. This is second. echo $editor->getContent(); // This is the first sentence. This is second. And this is third. $editor->getContent(); // This is the first sentence. This is second. A good example would be the job seekers where they subscribe to some job posting site and they are notified whenever there is a matching job opportunity. Defines a dependency between objects so that whenever an object changes its state, all its dependents are notified. Consider someone visiting Dubai. They just need a way (i.e. visa) to enter Dubai. After arrival, they can come and visit any place in Dubai on their own without having to ask for permission or to do some leg work in order to visit any place here; just let them know of a place and they can visit it. Visitor pattern lets you do just that, it helps you add places to visit so that they can visit as much as they can without having to do any legwork. Visitor pattern lets you add further operations to objects without having to modify them. In object-oriented programming and software engineering, the visitor design pattern is a way of separating an algorithm from an object structure on which it operates. A practical result of this separation is the ability to add new operations to existing object structures without modifying those structures. It is one way to follow the open/closed principle. $monkey->accept($speak);    // Ooh oo aa aa! $dolphin->accept($speak);   // Tuut tutt tuutt! We could have done this simply by having an inheritance hierarchy for the animals but then we would have to modify the animals whenever we would have to add new actions to animals. But now we will not have to change them. For example, let&apos;s say we are asked to add the jump behavior to the animals, we can simply add that by creating a new visitor i.e. $monkey->accept($speak);   // Ooh oo aa aa! $monkey->accept($jump);    // Jumped 20 feet high! on to the tree! $lion->accept($jump);      // Jumped 7 feet! Back on the ground! $dolphin->accept($speak);  // Tuut tutt tuutt! Consider the example of sorting, we implemented bubble sort but the data started to grow and bubble sort started getting very slow. In order to tackle this we implemented Quick sort. But now although the quick sort algorithm was doing better for large datasets, it was very slow for smaller datasets. In order to handle this we implemented a strategy where for small datasets, bubble sort will be used and for larger, quick sort. Strategy pattern allows you to switch the algorithm or strategy based upon the situation. In computer programming, the strategy pattern (also known as the policy pattern) is a behavioural software design pattern that enables an algorithm&apos;s behavior to be selected at runtime. Imagine you are using some drawing application, you choose the paint brush to draw. Now the brush changes its behavior based on the selected color i.e. if you have chosen red color it will draw in red, if blue then it will be in blue etc. It lets you change the behavior of a class when the state changes. The state pattern is a behavioral software design pattern that implements a state machine in an object-oriented way. With the state pattern, a state machine is implemented by implementing each individual state as a derived class of the state pattern interface, and implementing state transitions by invoking methods defined by the pattern&apos;s superclass. The state pattern can be interpreted as a strategy pattern which is able to switch the current strategy through invocations of methods defined in the pattern&apos;s interface. Let&apos;s take an example of text editor, it lets you change the state of text that is typed i.e. if you have selected bold, it starts writing in bold, if italic then in italics etc. The order of these steps could never be changed i.e. you can&apos;t build the roof before building the walls etc but each of the steps could be modified for example walls can be made of wood or polyester or stone. Template method defines the skeleton of how a certain algorithm could be performed, but defers the implementation of those steps to the children classes. In software engineering, the template method pattern is a behavioral design pattern that defines the program skeleton of an algorithm in an operation, deferring some steps to subclasses. It lets one redefine certain steps of an algorithm without changing the algorithm&apos;s structure. Imagine we have a build tool that helps us test, lint, build, generate build reports (i.e. code coverage reports, linting report etc) and deploy our app on the test server.